Peel and thinly slice garlic. Season short ribs with salt and pepper. Heat oil in a pot over medium-high heat and sear meat on both sides, then add garlic. Preheat oven to 160°C/320°F. Add Teriyaki sauce and beef stock to the pot with the short ribs. Cover and turn the heat to medium-low. Let simmer for approx. 10 min. Transfer the pot to the oven and braise at 160°C/320°F for approx. 2.5 hrs., turning short ribs occasionally. Approx. 15 min. before short ribs are done braising, cut onion and red onion into rings and slice mushrooms. Peel potato and radish, cut them into bite-sized pieces, and add to a pot of simmering salted water. Cook for approx. 5 min., then drain. Remove short ribs from the oven. Heat oil in a frying pan over medium heat. Add red onion, button mushrooms, and cooked potato and radish. Sauté for approx. 2 – 3 min. Add butter and some of the beef cooking liquid and turn the heat to low. Add the spinach and cook until wilted, approx. 2 – 3 min. 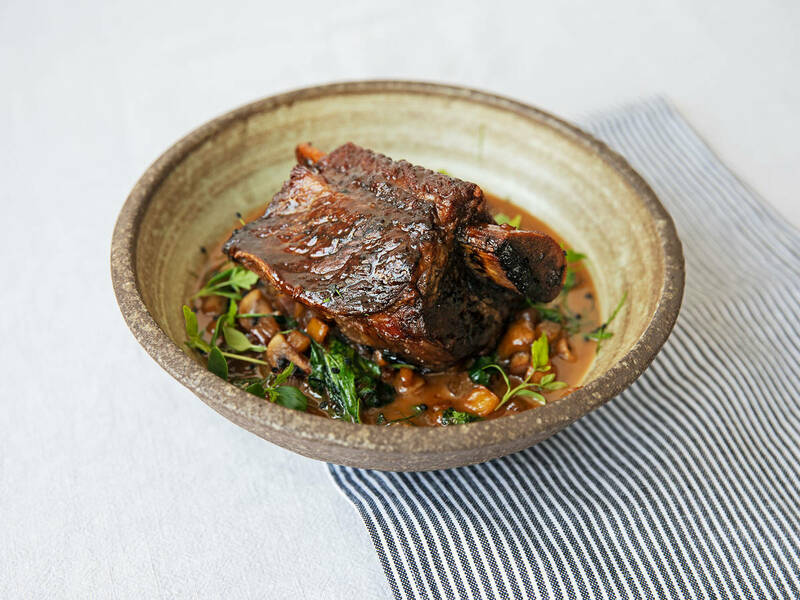 Add some of the cooking liquid from the ribs to serving plates, place short ribs in the center, arrange vegetables around the ribs, and serve. Enjoy!